I don't just have one Aussie I have 3 of them... I love them all with all my heart and soul. My oldest is Storm, he's going to be 9 yrs old in April of 2013, then next is Shyanne who just turned 3 in Nov and last but not least the newest addition is Kona who just turned 8 months old on Dec 20th. The picture has Storm in the back, then Shyanne and the one with the inquisitive tilt of the head in front is Kona. My dogs are just my pets, they don't do agility or herd although I think that Kona would be awesome at agility, I just don't know how to really go about getting her trained in it. But they are the best and I've had other breeds in my life... the Aussie is my favorite and will be what I have from now on till the day I die. They're sweet! We too have multiple Aussies, but only two. Aren't they just the most affectionate and eager little beasts? I too consider them my kids. In fact I found a thirst that says Aussie Mom! 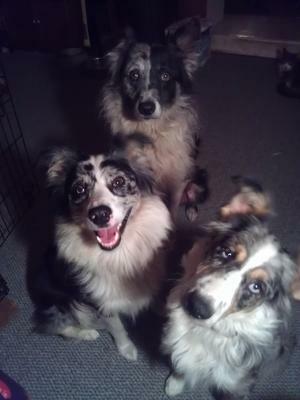 we have a 1 1/2 yr old Blue Merle and are looking for a buddy for him. He stays outside while we are at work, but spends the evening inside with us. My husband has found the only solution to all the hair--TWO vacuum cleaners. Small price to pay for the cheap entertainment every night!!! Do you keep them in the house? I got one Aussie, Stetson, then thought I needed another one. So Montana was next. We love them they are great dogs. Was wondering how you are dealing with all the hair? Or am I the only one that keeps them inside. I have a niece who has a border collie, she takes him in and has his hair cut off. I just can't bring myself to go that far. But considered it. I think my boy is bigger than your three. Mine were both 4 years old we we got them, If I had got puppies I could have trained them for the outside then bring them in of at night. Maybe your little beasts don't have a flock of animals to herd, but I bet they have herding tendencies. All I have to do for mine is act like I'm trying to "get away" and he is all about herding. It's a nightly drill we go through when I get home from work. Everything is fine until I get him so worked up he starts barking (while my wife is trying to play the guitar)...if you know what I mean. Aussies are so fun, I can't believe I was 46 before getting our first. Yours appear very alert. I'm sure they are great dogs.